Three local citizen groups, including the Clarke County-based Shenandoah Riverkeeper, filed a lawsuit against the U.S. Environmental Protection Agency for the agency’s repeated failure to address the Shenandoah River’s increasing problem with algae blooms and pollution. Joining Shenandoah Riverkeeper were Potomac Riverkeeper Network and the Potomac River Smallmouth Club; they are represented by Earthjustice. According to the suit, agricultural runoff in the Shenandoah Valley is causing the algae outbreaks. The groups say that algae blooms, caused by agricultural runoff in the Shenandoah Valley, interfere with recreational uses of the river, such as swimming, kayaking and fishing. 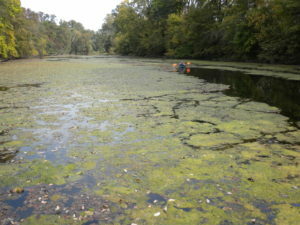 Algae blooms also harm native grasses and affect aquatic life. “The Shenandoah is one of the most beautiful rivers in the country—and a popular recreation destination. But it’s threatened by the failure of state and federal authorities to stop excessive nutrients—and the algae they produce—from entering the river. We hope this lawsuit will change that,” said Mark Frondorf, Shenandoah Riverkeeper. Frondorf says that for years, Shenandoah Riverkeeper has been pressing Virginia’s Department of Environmental Quality to designate the river as impaired because of the algae blooms. The agency has refused, says Frondorf, even as evidence of the impairment has grown. He cites a recent report by the Environmental Integrity Project, “Water Pollution from Livestock in the Shenandoah Valley.” The report found that Virginia’s pollution management system allows agricultural operations to dispose of their manure by spreading it on fields that are already saturated with nitrogen, leaving the excess to run off of fields and fuel algae blooms in the river. The lawsuit says EPA did not fulfill its duty under the Clean Water Act when it approved Virginia’s decision not to identify the Shenandoah River’s algae impairment on the state’s list of quality-impaired rivers and streams. EPA should have identified the Shenandoah River as impaired based on extensive data demonstrating that widespread algae blooms prevent the river from meeting Virginia’s water quality standards, says Frondorf. For information, see Potomac Riverkeeper Network for more details. Or contact Mark Frondorf, Shenandoah Riverkeeper.